Located in downtown Atlanta, on the east side of the Georgia Tech campus, Bobby Dodd Stadium is the oldest on campus stadium in the Division I Football Bowl Subdivision. Home of the Georgia Tech Yellow Jackets for nearly a century, Bobby Dodd Stadium was originally known as Grant Field and opened in 1913. Built at a cost of $15,000, the stadium had a capacity of 5,600 located today on what would be the west side. The first of several additions came in 1924 and 1925 when stands on the east and south sides were constructed increasing the capacity to 30,000. By the 1947 season, the original west stands were rebuilt with a press box pushing the capacity to 40,000. The north stands were built in 1958, a second deck was constructed in 1962 on the east side and by 1967 the west side was built, boosting the seating capacity to 58,121. In 1971, Georgia Tech decided to replace the grass field with Astroturf. Throughout the 1980s, fans attending games at the stadium saw several changes. In 1982, new scoreboards were installed and the stands on the south side were demolished in 1985, replaced with the Wardlow Center that houses the athletic department. The demolition of the south stands reduced the seating capacity to 46,000. In April of 1988, Georgia Tech honored former football coach, Bobby Dodd, by renaming Grant Field, Bobby Dodd Stadium. 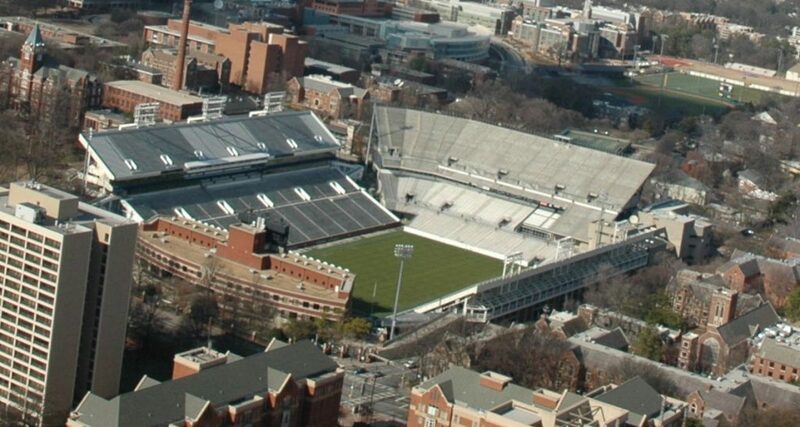 In the 1990s, 32 new suites and a press box were built and the Astroturf was removed and replaced with natural grass. Perhaps the biggest and most expansive renovation to Bobby Dodd Stadium came prior to the 2003 season. Georgia Tech decided to renovate and expand the stadium to seat 55,000 at a cost of $75 million. This included a new two-tier grandstand on the north end, seating 15,000, with luxury suites, offices and locker rooms. The east stands were rebuilt and now include 20 new executive suites. Additional seating was added on the south end zone in front of the Wardlow Building. A new video/scoreboard and ribbon boards were installed at Bobby Dodd Stadium in 2009.